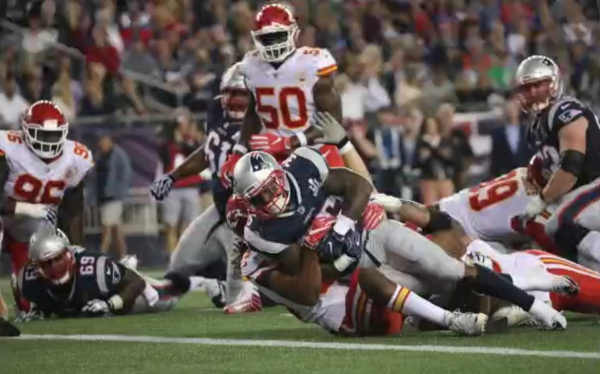 After stuffing the Patriots on fourth down, the Chiefs put together a 12-play, 90-yard touchdown drive to even the score at 7 in Foxborough. Stephen Gostkowski's 25-yard field goal is good and the #Patriots take a 10-7 lead. Gostkowski's 25-yard field goal is good. New England leads 10-7 with 14:56 remaining in the second quarter. Gillislee with the 2-yard TD run and #Patriots increase lead to 17-7. Mike Gillislee's Patriots debut is off to a good start. He runs in his second touchdown of the game, extending the Patriots lead to 17-7. Chiefs RB Kareem Hunt catches short touchdown with 13 seconds until halftime. Patriots still lead, 17-14. Tyreek Hill left wide open in Patriots secondary. He catches a 75-yard touchdown to put Chiefs ahead, 21-17, with 9:19 left in 3rd quarter.